The new East River Bridge is a continuous three span (54m-75m-54m), twin trapezoidal steel box girder structure complete with composite reinforced concrete deck. The superstructure is supported on semi-integral abutments founded on spread footings (east) and piled footings (west) along with large diameter reinforced concrete caisson supported in water Piers. In water piers incorporate a steel ice shield in order to limit extreme ice loading. Harbourside Engineering Consultants provided the structural bridge design services for this project, and worked closely with every member of the design consulting team so as to ensure an efficient, fully integrated effort from all team members. The scope of work for Harbourside Engineering Consultants included: overall planning and preliminary design of the bridge, the detailed design of the bridge structure, and full structural drafting. The bridge design utilizes an innovative double fixed pier system combined with a bumper and restrainer at each abutment to limit extreme movements allowing for the use of single gland expansion joints rather than the multi-gland systems, which would typically be required for structures of this length, saving considerable initial cost as well as long term maintenance. 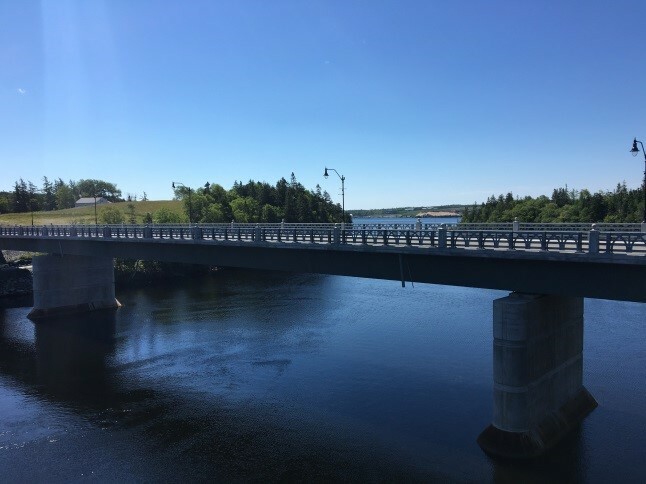 In addition to the parent bridge design, HEC completed Construction Engineering for the contractor including existing bridge demolition design, girder erection design and access trestle design.